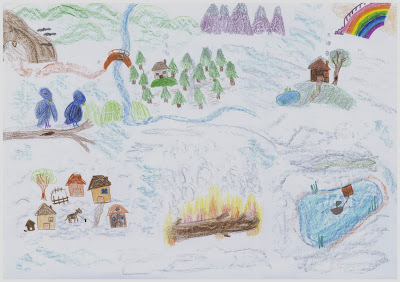 We received a large number of entries from the 12 & under crowd for the second art contest at The Norse Mythology Blog. 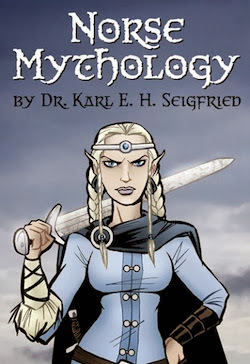 There are a lot of very talented young artists around the world who share an interest in the Norse myths! Since so many of the pieces submitted were so good, I had a very hard time ranking the entries – as did the two celebrity artists who joined me on the judging panel. Special thanks to both Anker Eli Petersen (originally from the Faroe Islands) and Erik Evensen (USA) for the time they spent carefully considering all the entries and sharing their thoughts. 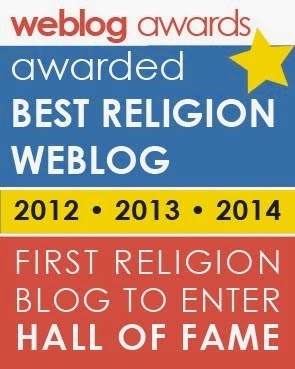 Congratulations to our three winners! The assignment was to create a piece that was on the theme of midwinter and contained at least one element from Norse mythology. These three young artists took very different approaches to the material and came up with very unique designs. I hope that they (and all the other talented artists who entered) continue to create such wonderful works. These kids really give me hope for the future! Two of the three winners in this group are from Cathy Yeoman’s group of Class 4 kids in Victoria, Australia. Her students made a clean sweep of the kids category in the Midsummer 2013 Art Contest, and they again made a very strong showing. Cathy has been teaching Norse mythology to her class throughout the past school year, and her ability to inspire young people shines through her students' work. I would like to personally thank her for her work in keeping the myths alive. Skál! Rani writes, "In my picture there is a young girl coming home on her sled with her dog and her horse while All-father Odin rides Sleipnir through the sky." I think that Rani has really managed to capture a sense of joy in her picture, and I love the way that the image of the horse on the ground is paralleled by Sleipnir in the sky. The composition of the work is quite dynamic, and Rani is very good at drawing horses! Erik agrees and says that "Rani has some excellent attention to detail on her horses and a very cool Sleipnir in the background!" 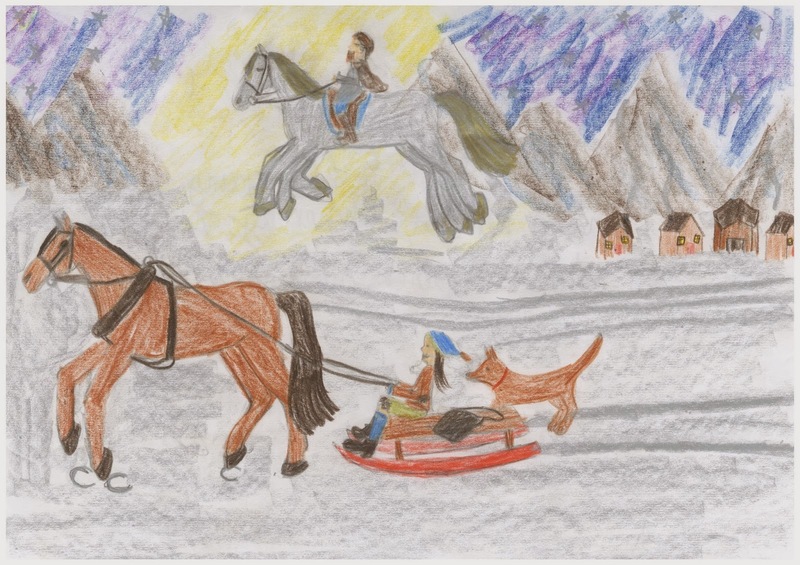 Alyssa wrote a detailed description of her entry: "This illustration portrays Odin and his spectral horse Sleipnir taking a slight moment to unwind during Yule. They’re exceptionally determined to have a brilliant hunt with their accomplices this Midwinter. Diligently they hunt for goblins and trolls that sneak about reeking of mischief for the townsfolk. 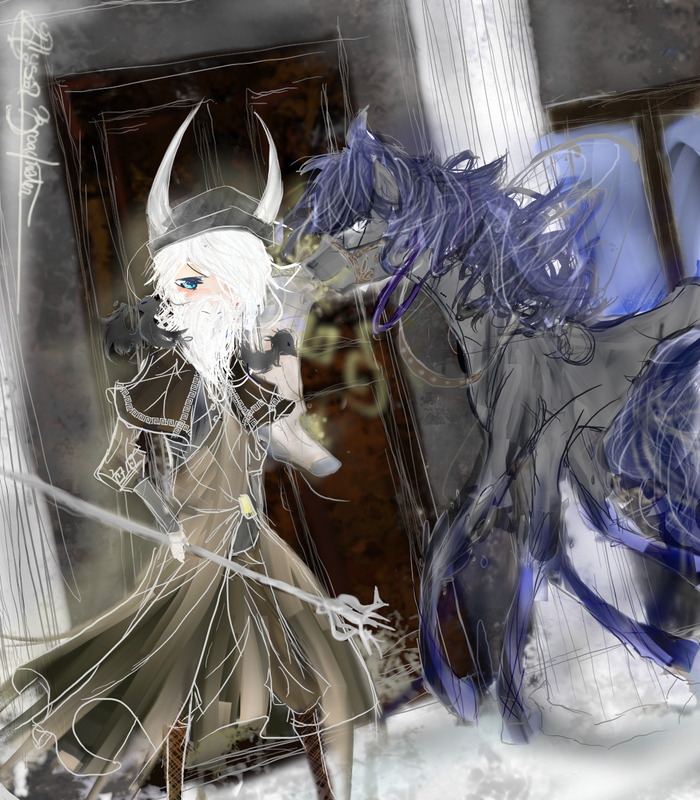 Sleipnir takes a moment to feed from the hay left by generous children for their gods while Odin takes watch." Anker Eli says that Alyssa's work shows "a quite sophisticated understanding and blend of mythological and folklorish elements. She even includes the Scandinavian Yule tradition with the feeding of Odin's horse." Erik thinks her "technical grasp of digital media is quite impressive. Her depiction of Odin is stylish and dynamic." Asha writes that her picture "is of Hugin and Munin, the ravens of Odin, flying around Midgard, watching the Yule log burn." Erik says, "Asha has created a wide-reaching landscape with a lot of interesting details." Please note the scary troll-cave at top left, the purple mountain majesties at top center, and (my favorite) the Rainbow Bridge with a very sensible guard rail at top right. You wouldn't want any of the gods to fall off while they're riding down to Midgard, would you?